“A wedding cake is the Grandame of cakes, the ultimate, the blow your guests away cake of all cakes! A wedding cake from my company ‘Karen’s Cakes’ is about the whole package, every element is as important as the next, from the recipes to the designs, my aim is to produce the very best of the best resulting in a perfect storm of unforgettable cake alchemy magic! My wedding cake designs are constantly evolving, incorporating the latest trends and twists to each of the collections and as with all our cakes they can all be personalised to suit your unique wedding day”. All our cakes can be ordered online, in store or over the phone. 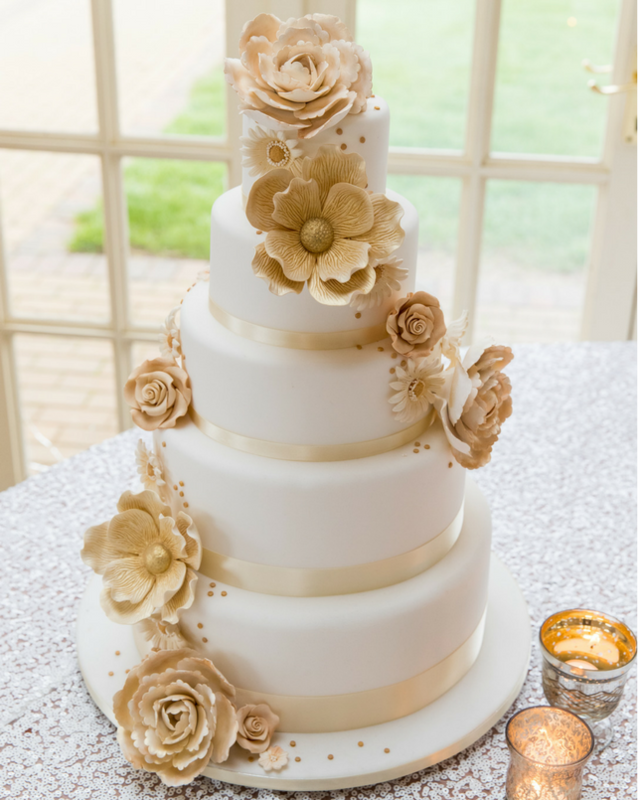 Each of our wedding cakes designs can be fully priced on our web site by using the ‘Order Your Cake’ section featured on each design page, this means you can find out exactly what the cost of your perfect cake will be before you even contact us. There are 4 distinct collections to choose from, The Showstopper Collection, all 5 tier designs, the top 3 tiers are ‘mock’, the bottom 2 tiers are cake which helps keep those all-important costs down, The Signature Collection, 3 and 4 tier cakes with beautiful styling that are perfect for any size of wedding as most designs within this collection can be ordered in 3 sizes, petite, standard or large. The Unique Collection, for those couples who would like something different and don’t mind an extra bit of expense to get exactly what they want. 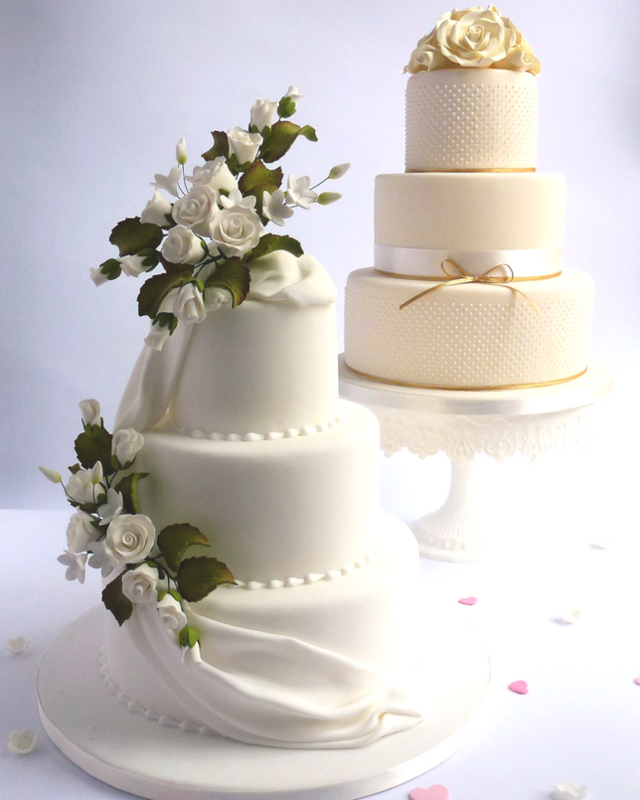 And lastly The Semi-Naked and Buttercreamed Collection, 3 and 4 tier cakes that manage to combine the style and presence of a traditional cake whilst maintaining a casual effortless sophistication. 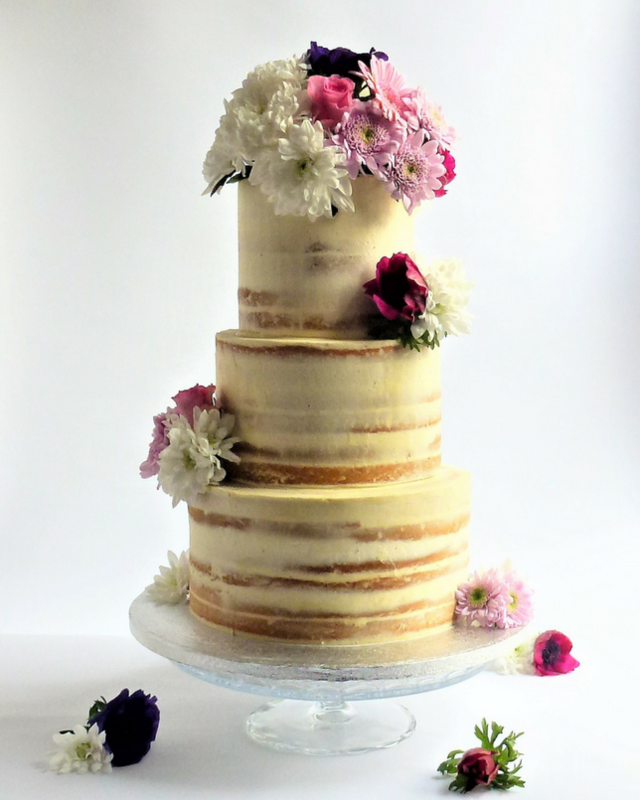 There is a choose of 8 different flavours, 2 types of fruit and 6 non-fruit cake for iced wedding cakes, for semi-naked and buttercreamed cakes we also offer a Victoria sandwich option. Descriptions of each flavour can by found by clicking the pink ‘Help me choose a flavour’ button on each design page. 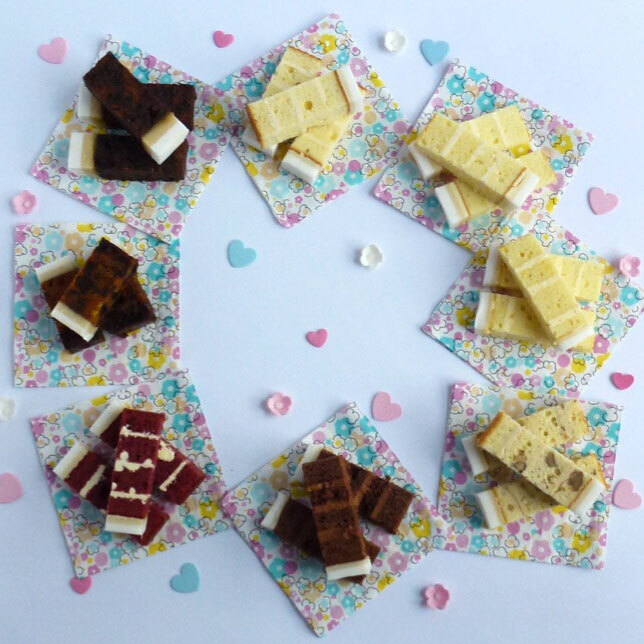 You can also order a cake tasting sample pack to be send to you for a small charge to help you make those all-important recipe choices. This charge will be refunded to you if you order a wedding cake with us. It is never too early to order your wedding cake with Karen’s Cakes but do require a minimum of 20 working days’ notice for non-fruit cakes, 30 days’ for orders containing all or part rich fruit cake and 40 working days’ for orders containing luxurious wedding cake. Please note there are certain times of the year when availability may be restricted. 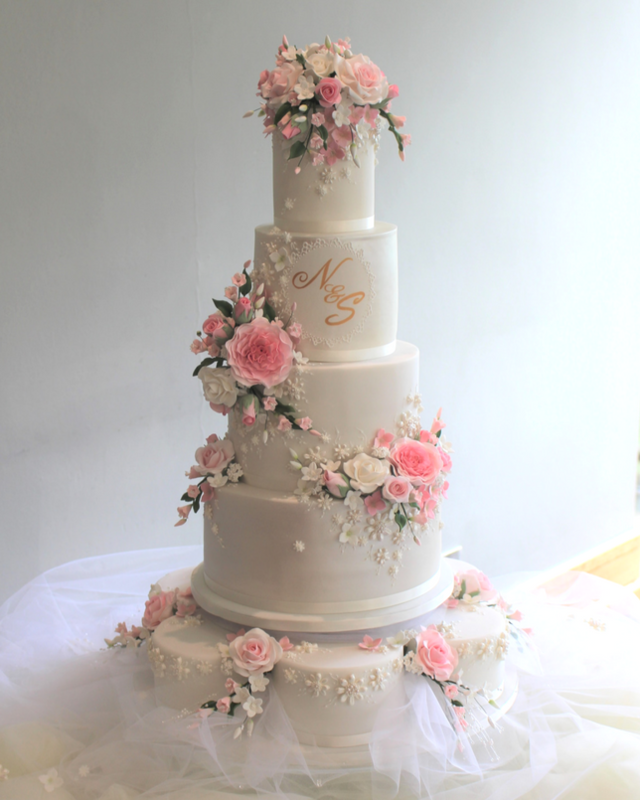 Many people choose to collect their wedding cake, alternatively we do offer a delivery service to hotels and venues in and around the Bishops Stortford area. There is a full list of places we regularly visit on the ‘Order your Cake’ section of each design page and we are happy to quote for alternative venues within the local Bishops Stortford area. Please note that our prices for delivery do not include delivery on Sunday or Monday, we are happy to quote for these days on an individual basis. Your order can be placed on-line, however, if you prefer to visit our shop where we have an amazing display of many our wedding cake designs we are happy to book an appointment for a tasting and face to face chat, just give us a call on 01279 508909.